Hacettepe University Children’s Hospital is the main referral hospital for children who are in need of BMT for malignant and (particularly) non-malignant inherited disorders that are commonly seen due to the increased incidence of family marriages. More than 50 %of the transplanted patient population consists of inherited diseases (for 26 different diagnoses), including very rare diseases. The majority of the patient population consists of high, and very-risk patients. Due to the lack of mid-level practitioners in the BMT Unit until recently, the nurses have gained significant experience in follow up of transplant related complications, participating in decision-making process as well. They are actively involved in developing institutional protocols in the follow up of patients with a variety of diagnoses. Location: SIHHIYE CAMPUS OF HACETTEPE UNIVERSITY in ANKARA, TÜRKIYE. 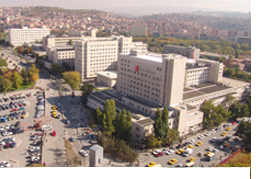 Hacettepe University Children’s Hospital is the biggest and the main university referral hospital in Türkiye for childhood diseases including malignant and non-malignant diseases. Yearly 7500 in-patients and 222.500 out-patients are followed in the Children’s Hospital. Transplant activity: The BMT unit has 4 patient rooms. 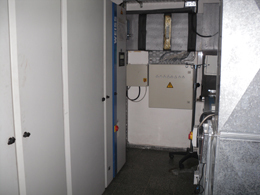 The unit is an allogeneic center and the patient population consists of high risk patients. Due to the increased incidence of family marriages in Türkiye the frequency of inherited diseases including immune deficiencies, bone marrow failure syndromes, metabolic diseases, neurometabolic disorders is increased. The medical and the nursing staff has gained significant experience in childhood transplants including rare diseases and troublesome cases. 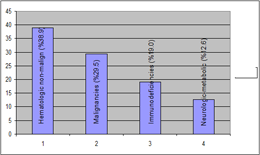 Stem cell source is bone marrow in about 80% of the cases and peripheral blood in the rest. Cord blood transplants are also done occasionally. The donors are fully matched sibling in ?? ?75% of the cases, partially or fully matched, or haploidentical parent or family member in ----% of the cases. Due to the long patient waiting lists with available family donors,our transplant team currently has not applied to EBMT for unrelated donor transplants.However, with the recently increasing pediatric transplant activity in Türkiye and upon shortening of the waiting lists, unrelated donor transplants may start in near future. Bone marrow processing is done at the Stem cell processing laboratory of pediatric hematology unit of our Children’s Hospital.The manipulations include red blood cell depletion, plasma depletion, volume depletion, CD34 positive selection and cryopreservation. BMT center also has experience in mesenchymal stem cell infusion to HSCT patients for steroid resistant graft versus hot disease or graft failure. Transplant team: The transplant active team consists of 2 BMT physicians and 8 nurses rotating through 3 daily shifts (8 hourly). In addition 2 faculty members in hematology and one in immunology units are also involved in transplant activities. 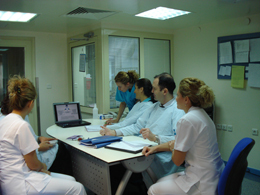 The nurses in the unit play a very active role and participate in decision making processes. There is an orientation program for new nurses. Continuing education and competency is implemented systematically with occasional quiz type evaluations. The head nurse of the unit has 14 years of BMT experience and is a member of the accreditation committee of the hospital. She participates in the training activities of transplant and oncology nurses all over the country. The outpatient nurse is a senior nurse with > 10 years transplant experience. She is primarily involved in pre-transplant assessment, preparation of patient and donor candidates, family-patient meetings and long term follow up of post transplant patients. The secretary of our BMT unit has been working for 8 years in the unit. In addition to the administrative duties, she has been responsible for organizing/co-ordinating the pre- and post-transplant patient, donor, family issues, stem cell collections and interactions between the BMT unit and Apheresis unit/Blood bank,Stem cell processing laboratories and Ministry of Health offices. The dietician makes daily rounds to the unit and contacts the-caregiver of each patient and the staff nurse and/or physician to be informed about the changing medical condition and nutritional status. 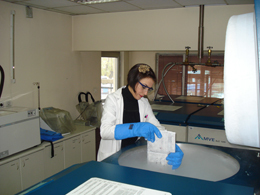 Daliy calori, protein, fluid intakes are recorded and parenteral nutrition requirement is assessed. 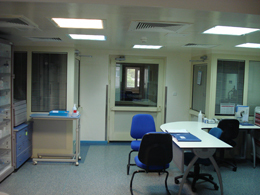 Parenteral nutition is prepared in the hospital central Office. The Children’s Hospital has a large academic staff including all disciplines needed for multidisciplinary follow up of transplant patients. The pediatric units closely involved in transplant patients and related issues are, infectious disease, gastroenterology, nephrology, pulmonary, endocrinology, cardiology, neurology, metabolism, surgery and other departments include radiology, dermatology, ophtalmology and ENT. All chemotherapy preparations, including weekend days and holidays, are done in the central chemo-preparation office by the professional team. 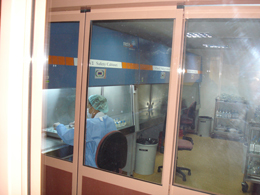 The cleaning work is done by the hospital’s cleaning three times a day. 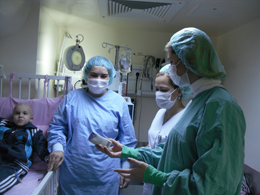 The mothers /caregivers of the patients stay 24 hours in the patient room and throughout the hospitalization period. There are laundry, bathroom, kitchen facilities for caregivers. The nursing team makes weekly meetings with caregivers to assure their orientation to the unit rules and for psycho-social support. In addition,families and patients are informed periodically and when necessary by the medical team about the disease condition and transplant dynamics.